One of the newest, hottest topics in health food supplements today is mangosteen! The whole fruit of a mangosteen contains compounds called xanthones: naturally occurring, high-potency antioxidants found primarily in the peel/hull of the fruit. Mangosteen has been revered for centuries as "Asia's Queen of Fruits". Of course, you don't need to take our word for it. Research scientists are now discovering that there is valid science behind the folk medicine traditions and the answer seems to be in the mangosteen's compounds called xanthones. There have been 43 xanthones discovered in the fruit thus far (mostly in the rind); some unique only to the mangosteen. Xanthones are potent anti-oxidants and are used for their antitoxic benefits; they have been found to have potent anti-inflammatory, anti-bacterial, anti-viral, anti-tumor and antifungal properties; they help with neurological and cardiovascular disorders and have other healing properties as well. These properties have prompted health professionals to utilize the mangosteen in a variety of conditions, including pain, gastrointestinal problems, dermatologic diseases (including eczema, skin sores and lesions, etc. ), musculoskeletal conditions, dental/oral disorders and much more. The mangosteen is one of nature's only readily available sources of xanthones known thus far. Additionally, mangosteen was used traditionally for its anti-parasitic effects: Malaria, amoebic dysentery and syphilis are caused by parasites. Asian healers have used mangosteen for centuries to deal with those illnesses. In South America, mangosteen is also used to cure intestinal worm infestations. Laboratory research to confirm these practices, however, is not yet available at this time. If one is seeking therapeutic results from mangosteen, he or she must commit for a period of three months of use. If you are on prescribed medications consult your physician before consuming mangosteen supplements. We also recommend that you take your prescribed medication at least 45 minutes before or after consuming your mangosteen supplements. Minor to Mild Condition/Illness (two capsules - two to three times a day): With this regimen, 1 bottle of capsules will last 20 days. If you are currently on doctor prescribed medication or addressing conditions such as mild arthritis, carpal tunnel or other joint, bone or body pain; cardiovascular health, diabetes or just want to lose weight then you will want to consume two capsules two to three times a day. Severe to Chronic Condition/Illness (two to three capsules three to four times a day): With this regimen, 1 bottle of capsules will last 15 days. If you are currently under continuous doctor or specialist supervision, consume large amounts of prescription medication or have been dealing with your medical issue for longer than one year then you will want to consume two to three capsules three to four times a day. Protocol for Diabetics and Dieters: It is important to note that you should consume the same number of capsules, based on your health category (as above), but do so 30 to 45 minutes after a meal. The rich fiber content in our Mangosteen Capsules will make you feel fuller. For diabetics, the fiber will absorb the sugars from the food you eat and not spike your blood levels during the normal digestion of a meal. As you start to overcome your condition or illness, you will be able to reduce the number of capsules you consume per day, by first reducing the number of capsules during each intake and then by reducing the number of intakes per day. 1 Capsule Every 6 - 8 Hours: No real medical issues, not under primary care or consuming any pharmaceutical medication. 2 Capsules Every 6 - 8 Hours: Currently experiencing minor to moderate health challenges and may be under primary care and consuming some light to moderate quantities of pharmaceutical medications. 3 Capsules Every 6 - 8 Hours: Currently experiencing moderate to severe health challenges or crises and are under primary care and consuming large amounts of pharmaceutical medications. For those who have a condition that requires urgent attention, it may be helpful to use the loading dose. This dose is not for everyone, and may rarely cause side effects such as loose stools or constipation. The reason for side effects is the sudden introduction of the mangosteen to the body in large quantities. The side effects are not dangerous, and are no more than an inconvenience. Another reason for using the loading exposure would be if you sense that an illness is about to strike. For instance, if you wake up with a scratchy throat or find yourself becoming congested, lethargic, or experiencing malaise, you may want to switch to the loading dose. when using mangosteen for symptomatic control of chronic disease. Mangosteen is a home remedy and should never be viewed as a replacement to medical intervention. The maintenance dose of one capsule twice a day will enhance internal protection against viral, bacterial, parasitic, and fungal infection. Some of the side effects that could be experienced from the use of mangosteen can be classified as mild allergic reactions, while others fall into the category of detoxification reactions or healing crises. The most common symptoms of allergic reactions include skin redness, swelling, itching, and rash. If one experiences any of these symptoms while taking the mangosteen, he or she should stop using mangosteen until the symptoms subside. These allergic reactions are both temporary and benign. Discomfort is the worst thing that can occur. A few people upon starting to use mangosteen may experience transient joint pains, mild headaches, aching muscles, stomach upset, loose stools, insomnia, or interrupted sleep. 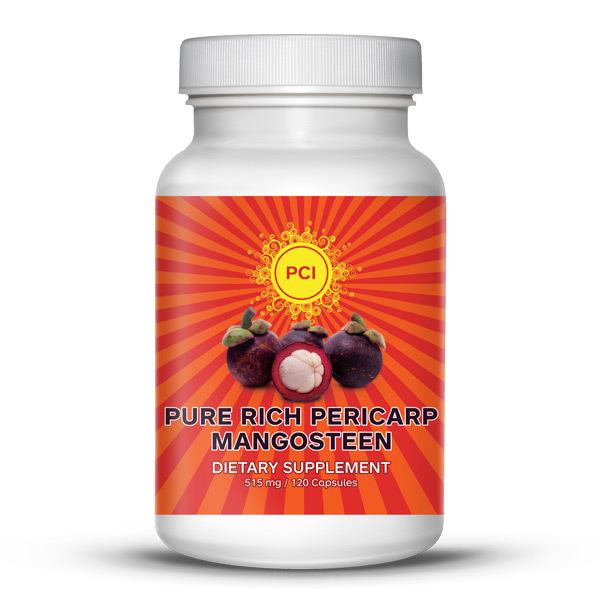 If the symptoms recur and persist for greater than two weeks after stopping then restarting a lower dose mangosteen regime, you can conclude that they are allergic reactions and the affected person cannot use the mangosteen. If the symptoms are tolerable, there is no need to interrupt use of the mangosteen-as the problem will subside without intervention. In the event that nausea, vomiting, or generalized rash should occur, mangosteen should not be restarted-even as a trial at a low dosage-until a doctor has been consulted. Also remember that the signs or symptoms of serious disease can occur coincidentally with starting the mangosteen-and rather than simply being attributed to the side effects of the mangosteen, these symptoms should be investigated by a physician. It is very important that you stay in close contact during the first 30 to 90 days of starting on the mangosteen product: to ensure that PCI Mangosteen is providing you with the maximum benefits. We encourage your feedback, and want to help you every step of the way with our PCI Mangosteen Product. Blood borne parasites The CDC describes the different blood borne parasites.